Keeping our teeth bright and white is something we all desire. But it doesn’t have to be a hassle or a headache or even terribly expensive. It shouldn’t take a whole lot of time either. Don't overwhelm yourself by spending hours choosing, or worse, wasting money and time on the wrong kit. Rather than risking it, we've hand picked the best teeth whitening kits based on price, value, safety and customer satisfaction. You're in good hands. If you’ve made up your mind on the do-it-yourself teeth whitening route, now you need to find the best teeth whitening product. In this article We’ll tell you what works and what doesn’t. We’ll even review the 8 top rated products available, and you’ll be able to decide what’s best for you! THE HOW: How Does Home Teeth Whitening Work? Home Abrasive Teeth Whitening...Should you be Worried? Which is the Overall Best Teeth Whitening Product for You? Home Based Teeth Whitening Kits, Explained. ME ME ME: Which Kit Is Best For Me? The BEST Home Teeth Whitening Kits in Australia, Reviewed. There are two primary ways that these home-based oral products work. Either an abrasive product is used (as in the case of whitening toothpaste), or a bleaching agent is used (as in the case of teeth whitening strips). Choosing which type of product to use will depend on a number of factors including the severity of staining, how many shades lighter you wish to go, and how much money and time you’re willing to spend. We’ll explore some of the most popular options below to help you decide. Don’t be scared off by the name, when we say abrasive, we’re talking about tiny, minuscule particles that are added to these toothpastes. These products work by gently scrubbing your teeth, scraping away some of those built-up stains whilst you perform your normal brushing routine. Please read our disclaimer below. You will have already seen the ads on telly and the promos in shopping centres that promise to give you a Hollywood smile and to keep it that way. Which kit suits MY needs best? If you are unsure keep reading this page and check out our teeth whitening reviews for all the best at-home products that we have available to us today. Teeth whitening does work. That’s the first thing to clear up. But as with any popular trend you do need to be careful in your choices to ensure you get the results you're after. Educating yourself on how it works will help enormously when it comes to making the best choice. And, remember if you have sensitive teeth, it's recommended that you visit your dentist first to ensure it's not a sign of any bigger dental problems. Your dentist could also help with desensitizing treatment, so that your teeth not only look great but you feel great too! As you try to find the best options you have a wide variety of products to choose from. The DIY range includes everything from take home tooth whitening systems that come with pre filled trays, whitening strips, whitening pens as well as toothpastes, gels and rinses. Each tooth whitening option will have its own pros and cons. Some are more easier to use while others more difficult. Some require a bit of time commitment while others do not. You can also expect some products to be more effective and the others to be not as great. Some will be perfectly safe to use at home while others may cause permanent damage to your teeth, so it is necessary to be careful in making your choices. Costs also vary significantly when you consider the whole range to find the best teeth whitening products at home that also suits your budget. Now let us take a detailed look at the options. If you drink things like coffee or red wine, you may need to take extra care to keep your teeth white. Whitening toothpaste cannot change your teeth colour. But it can help whiten your teeth slightly by removing surface stains from substances like coffee or tobacco. This toothpaste cannot remove stains that go deeper than the surface. Most whitening toothpastes contain bleaching agents and abrasives that gently polish the tooth surface. The Australian Dental Association says that this toothpaste contains low concentrations of around 3 percent of hydrogen peroxide, the main bleaching agent in whitening products. It helps breakdown and dissolve stains. Use whitening toothpaste twice daily and no more. Excessive use may be harmful to your teeth. It takes between two to six weeks to see visible results. read more about whitening toothpaste here. Whitening strips are a very popular method. You’ll see a huge range of brands in the market today. Thin, flexible strips coated with a gel containing peroxide, a bleaching agent, will remove surface tooth stains that discolour your teeth. These strips are designed to mould with the shape of your teeth and keep the bleaching gel in place so it can work on the teeth stains. As teeth whitening options go, strips are easy to use, convenient because you spend very little time on the process. Typical instructions would be to apply the strips twice a day for around 30 minutes for two weeks. Strips are more affordable than with your dentist or at home teeth whitening kits. Make sure to apply strips according to manufacturer's instructions and leave them on for the required time period. You can expect your teeth to be lightened by 1 or 2 shades. You will be able to see initial results within a few days. Expect the final results to last for around 4 months. Do not use them or any other bleaching products on anyone under 16 years or if you are pregnant or lactating. People with sensitive teeth and gums and those who are allergic to peroxide should avoid peroxide based whitening products. The cost can be in the range between $10 to $60, depending on the brand. Packs may contain strips to last you anywhere from 12 days to 4 weeks. Your dentist will inspect your teeth and general oral health and recommend a method best suited for your needs. Safe bleaching products will be applied safely to avoid harm to your teeth, gums or mouth tissue. Dentists can use higher concentrations of peroxide based bleaching agents because it is done under professional supervision and last only for a limited time. As a result, you can generally expect very good, consistent results with professional teeth whitening. Your dentist may offer you a choice from among a number of popular laser teeth whitening treatment methods including Zoom, Smartbleach KPT and Smartlight 3LT. Let us find out more about each system so you know how to pick the best professional teeth whitening method to suit your needs as well as your budget. Zoom WhiteSpeed in-chair is a bleaching procedure that combines hydrogen peroxide gel and UV light treatment. After your teeth are cleaned properly and the gel is applied, the Zoom light treatment helps break down the stains easily. A treatment session typically takes around 45 min to one hour and you can see results immediately. How Long does it Last and What's the Cost? Zoom results can last between 12 to 36 months. A session costs between $800 to $1,000. To sustain the results, your dentist may recommend you use other Zoom products, such as Zoom DayWhite or NiteWhite to take home. Smartbleach a non-acidic gel with laser of laser like light treatment to target tooth stains. It works well for teeth that have become discoloured due to smoking, staining foods such as coffee, tea, soft drinks and other poor dietary habits. The final result is natural looking, highly-consistent, whitening results. Smart Bleach results are long lasting. Dentists say you may experience the benefits for as long as 3 to 5 years. A typical Smartbleach KPT whitening session lasts between 60 to 90 minutes. After each whitening session you can see the results immediately. Most people just need one session. A one-time treatment with Smartbleach KPT costs between $1,300 to $1,500. It may seem like the professional teeth whitening cost is very expensive but they offer long lasting results performed by a professional. In-office professional whitening systems produce the longest lasting results. But they are expensive, costing you between $800 to $1,500 per treatment session, depending on which system you choose. The lowest cost options you have are whitening toothpastes and strips. These may produce visible results, but the results are not long lasting and you’d need to repeatedly use these products. That is a problem because excessive or long term use of abrasive toothpastes with bleaching agents such as peroxides or peroxide gel coated strips can cause damage to your teeth. In between the two ends of the spectrum are the home teeth whitening kits. They are affordable and offer you good results and value for money. Most importantly, there are choices you can make to ensure safety, consistency and longer lasting results. Is this more what you had in mind when you started researching different whitening methods? It’s definitely the most popular option and it’s easy to see why. With longer lasting and better quality results coupled with at home convenience, these products beat their competition every time. These will generally require you to apply a gel or cream that contains a bleaching agent (hydrogen peroxide or carbamide peroxide) for 30 - 60 minutes a day, often aided by a super bright LED light that supercharges the results. When you use one of these products, you’ll need to develop a regular routine to ensure that you get the best results. You can expect to see results in as little as a week. The results will last anywhere from one or two months, and even up to a year or more in some cases. Home based teeth whitening kits are for those with a heavier stain, or for those who haven’t had satisfactory results from their toothpaste. They’re the perfect at home solution. With easy to follow instructions and an affordable price, these products have recently seen a massive surge in popularity. With the huge choice available, it’s recommended that you consult with your dentist prior to purchasing one of these to ensure that you’re choosing the best products to whiten your teeth. For best results in a home kit, make sure your kit contains either hydrogen peroxide of carbamide peroxide. ​All the best teeth whitening products sold over the counter will have them, it's the reason why they are all so effective when it comes to bleaching your pearly whites. This ingredient is one of the most, if not the most essential one out of all when it comes to advanced teeth whitening treatments. So, make sure to check the ingredients label before buying a product. Now, let's get into details on what it actually does to your oral health. Whats the difference? Not much, really. Carbamide peroxide goes through a chemical transition when whitening and breaks down in hydrogen peroxide. Meaning they both end up as.... hydrogen peroxide. Yes, this means hydrogen peroxide will whiten your teeth faster, and more effectively. But the issue here when HP is used in take-home kits is that you may leave the gel on for too long and burn/damage your teeth or gums. This is the risk that you will have to deal with if you are planning to do your teeth whitening at home. To avoid this from happening, please read the instructions carefully and follow it religiously to avoid any possible oral health problems. Other than leaving it on for too long, there really isn't any known side-effect of this ingredient. For this reason, Carbamide Peroxide is a better choice for take home kits; it will do the same thing and there is less chance of hurting yourself! But what about natural whitening? Naturally, natural whitening comes to mind when speak of whitening kits and chemicals, such as Peroxides and other abrasives commonly used in these products. And fair enough. If there is a natural solution, why wouldn't you want to take it? The bottom line is: Whitening kits, such as the kits you're about to read about, work. And they work quickly. There is a little more risk involved with using these kits, but if you're looking for white teeth fast, you can minimize this risk by following a few basic rules and speaking to your dentist. Natural methods DO work, although you'll see slower progress. But why not give them a shot in the mean time? You have nothing to lose. Read our guide to natural teeth whitening right here. Budget vs effectiveness: Don't choose something just because its cheap. You get what you pay for - thats why whitening toothpaste does NOT work. ​How many applications do you need? Is it just a once off, or do you plan to re-apply later in the year (it doesn't last forever - stains come back). The bigger the kit, the better value for money. Doing a simple online search for teeth whitening kits will leave you overwhelmed and confused since there is so much competition in this space. So, for people that are looking to get their teeth whitening at home; you should really get into this list as it will save you tons of time on research and comparing one product to the other. Extras - LED light, Spare mouth trays, Desensitizing gel, whitening pen, step-by-step guide. While it may look a little more expensive than some of the other options, this value kit actually has, at least, double, if not triple the amount of whitening gel that other kits provide - up to 6 months' supply! This means that you end up saving money, as one whitening treatment is usually not sufficient with at-home teeth whitening kits. "This is one of the best teeth whitening products over the counter"
With the easy to follow instructions, and all the included extras representing excellent value, - it was an easy choice for our number one pick - Brighter white offers on of the best teeth whitening methods and has thousands of raving customers - Take a look at their kits here. Whats Inside the Brighter White single Kit? 3 mouth trays, 6 tubes of whitening gel, 2 tubes of re-mineralization gel, and LED light and a whitening touch up pen. Lots of value! VALUE - on first glance you may see that the brighter white kit is slightly more expensive than others on this list - BUT - you get 2-3x the whitening gel, so you'll be able to keep your teeth whiter for much longer! Inclusions - LED light, mouldable mouth tray, teeth shade guide, teeth re-mineralisation gel, extra mouth trays. Kapow Smiles are the new kid on the block in teeth whitening in Australia. Their mission - provide the strongest kits to help you achieve the best results in the quickest amount of time possible. They currently offer the strongest and most effective gels on the market with a concentration of 18% carbamide peroxide. This ingredient is effective and safe for home whitening. This kit includes everything that you would expect from an at home kit and they often have flash sales so check their website before ordering by clicking the button below. Whats Inside the Kapow Smiles single Kit? You'll get the users guide, 2 x mouth trays, and led light, 3 tubes of whitening gel and one tube of re-mineralization gel. STRONG WHITENING GEL - with an active ingredient of 18% carbamide peroxide, you'll be using the most effective teeth whitening gel in Australia in terms of strength. CRUELTY FREE - They are ethical. All products are 100% free of animal by products. You don't want to support animal cruelty, do you? AMAZING SUPPORT - With 100% dedicated and committed customer service support, you can be sure you'll have no issues. Best suited for - If you're looking for a strong, effective yet safe home whitening kit thats somewhat ethical, give Kapow Smiles a look today. Mouth tray? - yes, 4. Marketed as their ‘luxury range’, this product from Perfect Whitening promises to make your teeth up 8-12 shades whiter. With a whitening pen, desensitizing gel, and four mouth guards (in case something happens to your first two) the Perfect Whitening kit is good value for money for those who don’t want half a year’s supply of whitening product hanging around. Depending on when you order, you may be eligible for a discount on the advertised price. Just head to their website to find out. Whats Inside The Perfect Whitening Single Kit? You'll get two boxes. The small grey one is a bonus gift of teeth whitening strips to maintain your smile. The white box contains 3 large tubes of whitening gel, one tube of re-mineralization gel, 4 mouth trays, an LED light and a whitening touch up pen. LOTS of value. MORE VALUE - A little more expensive than some brands, but you get a whole lot more, meaning whiter teeth for longer. FREE WHITENING STRIPS + PEN - All kits come with bonus free whitening strips AND pens meaning you'll be able to maintain that smile for longer without re-ordering. Extras - 10 pack of natural whitening strips worth $50 (limited time offer) and shade guide. A single kit of Advanced Teeth Whitening includes 15ml of high viscosity whitening gel that can see you through over 20 whitening sessions and last upto 2-6 weeks. The mouldable mouth trays will ensure that your teeth are consistently covered with the whitening gel. 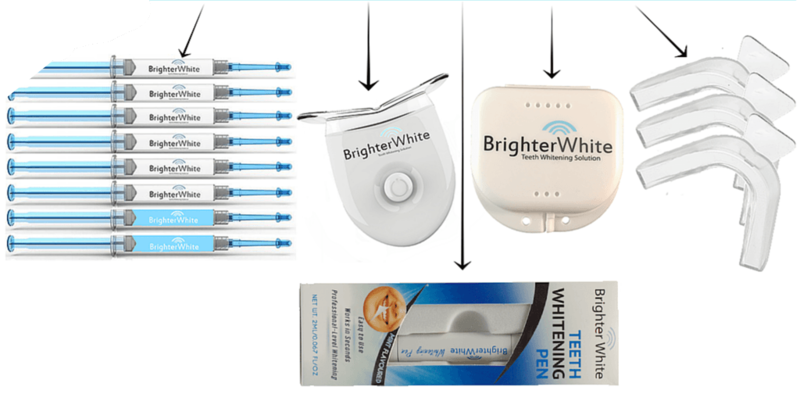 The accelerator LED light from Advanced Teeth Whitening uses the same plasma “Blue Spectrum” treatment that dentists use for laser whitening. The product comes with a “Noticeably Whiter teeth or 100% money back” guarantee. Just 30 minutes of use will make your teeth noticeably whiter, but the manufacturer recommends a minimum of 30 to 60 minutes a day for maximum results. You can expect to see up to 12 shades whiter teeth in just two weeks of use. What’s Inside the Advanced Teeth Whitening Professional Kit ? Each kit contains 1 set of teeth moulding mouth trays, 3 (5ml) tubes of whitening gel, a tube of remineralization gel and 5-light LED light device. AFFORDABLE, LOW PRICE - At $67 per single kit, Advanced Teeth Whitening Kit (up to 12 Shades Whiter). The Pro Pack Couples Kit offers an even better deal amounting to just $60.25 per person. 12 SHADES WHITER PROMISE - If the promise delivers, you get one of the best deals with their kits because not everyone claims to offer such dramatic results in their teeth whitening kits. Double Pack - $197 ($98.50 each). Extras - A mouthguard case and enough whitening gel for 12-15 treatments. Pearly Whites moulds can be easily customised to fit your teeth perfectly. This is one secret to consistent and proper whitening results. Pearly Whites recommend that you leave the whitening gel on for about 45 minutes to an hour. Most Pearly Whites users can expect to see results after just one or two applications. With the Pearly White brand and its commitment to quality products, you can also expect an unrivalled customer support service at every stage. Each Professional Kit comes with 1 set of mouldable mouth guards, a mouth guard case, 3 tubes of highest legal grade whitening gel, desensitising gel and a 6-light LED light device. The starter kits do not contain the mouthguard case and desensitising gel and come with a 5-light LED device and 2 tubes of whitening gel. PROVEN RESULTS - There is no money back guarantee for Pearly Whites. But that is more than compensated for the fact that it has been voted you can read reviews of hundreds of satisfied customers on their Before and After Page. WHITENING GEL REFILLS - Save money by getting the whitening gel refills and reusing your moulds (which come with a cover to keep it safe for reuse) and the LED lights. Extras - Whitening pen, step-by-step instruction manual, shade guide and travel box. The SmilePro Advanced Teeth Whitening Pack comes with a “Noticeably whiter teeth or 100% money back” guarantee. It has been clinically proven to make your teeth 10 shades whiter, according to the company. If used according to instructions, you may expect a brighter and whiter smile in just 30 minutes! It's one of the few home teeth whitening kits we came across that does not provide desensitizing gel as part of the pack. But it comes with a handy travel box. Although the single kit price is on the higher side, if this is your chosen brand, the double kit, Best Friends Advanced Whitening Twin Pack, makes it a lot more affordable. You can also purchase Advanced whitening gel packs as refills, saving money over the long term. 3 tubes of Whitening Gel and a bonus gel pack, mouth tray, accelerator whitening light, a teeth whitening pen, a Shade Guide, Step By Step Instruction Manual and a travel box. MONEY BACK GUARANTEE - SmilePro whitening kits come with a “Noticeably whiter teeth or 100% money back” guarantee. Double pack kit price - There’s no double pack. A discounted subscription model fills this gap. HiSmile’s peroxide-free teeth whitening gel uses Sodium Perborate, instead of hydrogen peroxide. HiSmile offers you the option of signing up no-strings-attached and receiving up to 30 percent in discounts every month on your purchases. HiSmile also sells other whitening and oral care products such as toothpaste, coconut whitening mouthwash, whitening pens and gel refills. Product bundles that combine whitening kits with other products are priced between $99.99 to $119.99 offer you the ultimate whitening experience and luxury depending on your budget. 3 gel tubes (for six uses), LED Light, Mouth Tray, Shade Guide, and instructions manual. PEROXIDE FREE WHITENING - The whitening process is peroxide free. This means your risk of developing sensitive teeth and other issues is minimised. Active Ingredient - 18% carbamide peroxide. According to Bondi Smile instructions, one whitening session should last upto 10 minutes and after that you can repeat up to 3 more sessions (40 minutes altogether) in one go. 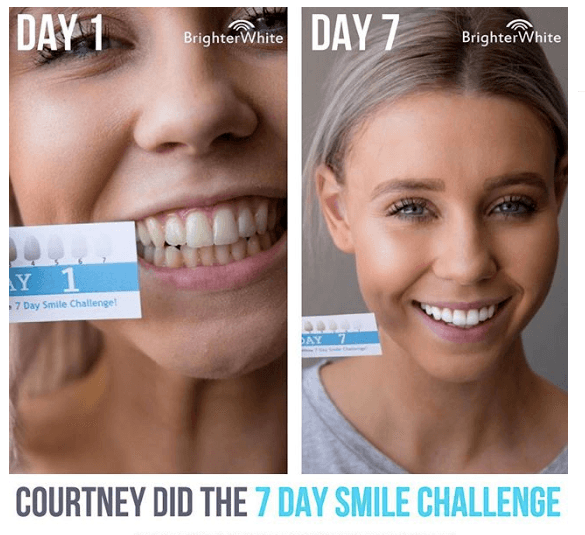 For best results, you are asked to whiten teeth for 7 consecutive days, and then to keep up whitening once or twice a fortnight to maintain results. Those seeking bulk discounts can also go for Bondi Smile Legends Ultimate double pack or Squad pack. Price per single Ultimate kit then works out to $79.98 and $74.99. 3 whitening gel syringes, 1 whitening tray, LED teeth whitening light and an instruction manual. SAFE PRODUCTS - All Bondi Smile products are made in the US, confirming to the highest standards. So you are going to find the product both safe and effective. 2 to 8 SHADES WHITER - Bondi Smile guarantees this, when instructions are followed. Be consistent. Set a routine and stick to it! Don’t get carried away! These products are perfectly safe to use, as long as you follow the instructions. Excessive use (more than the manufacturer instructs) will lead to complications like thin, dull tooth enamel and very sensitive teeth, similar to teeth whitening strip overuse. So, now that we have all the information provided for you to get the best possible treatment then it's all up to you now to make sure that you do it the right way. Doing your own teeth whitening at home is a simple process but it can be a very delicate one at that. With these products, more isn't always necessarily better, it's advisable to just stick with the instructions and be patient, after all we only have one set of pearly whites.